If you own or manage a restaurant in the Birmingham, AL area with carpeting in it, you will probably be in need of Professional Carpet Cleaning at some point. Heaven’s Best Carpet Cleaning provides one of the Best Restaurant Carpet Cleaning Services in Birmingham, AL. Because Restaurant carpets get lots of use and can have all sorts of food items spilled on them, it is important that you have them cleaned often. At Heaven’s Best, we realize that along with dirty carpets, you may also have an extremely tight budget for cleaning. That is why we offer some of the most competitive Restaurant Carpet Cleaning rates in Birmingham, AL. We also offer maintenance plans to fit most any budget. When you are thinking about who to hire, one of the best resources is the IICRC, the Institute of Inspection, Cleaning, and Restorations Certification. This organization is committed to providing the best training, as well as certification for carpet cleaning technicians in the US and world-wide. Heaven’s Best of Birmingham’s Carpet Technicians are IICRC trained and certified. Our firm is also an IICRC certified firm, which means we follow the IICRC’s code of ethics and are required to go through a stringent process to become certified. As well, we must have a system in place to guarantee quality work. You can rest assured that when you call Heaven’s Best you will get quality work, great rates and excellent customer service. 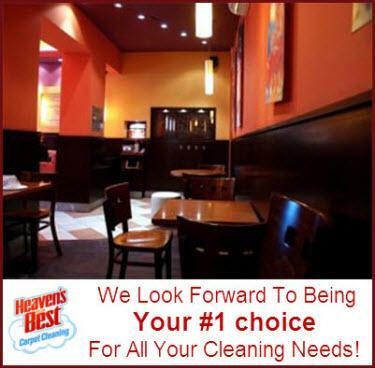 So, don’t wait any longer to have your Restaurant carpets cleaned, call Heaven’s Best today at (205) 618-9150. We will come out at your convenience and measure the area and give you a FREE ESTIMATE to clean your carpets as well as any other flooring type you may have. We also clean VCT Tile, Tile & Grout, Hardwoods, Upholstery and Stone Floors. We have flexible schedules so we can do the actual cleaning at a time when your restaurant is closed. Please use the form below to contact Heaven’s Best right now to schedule a FREE ESTIMATE for the Best Restaurant Carpet Cleaning in Birmingham, AL. You will be happy you contacted us!